Sutton Lakes community in Jacksonville, Florida. Sutton Lakes is ideally located just south of Atlantic between Kernan and St. Johns Bluff. 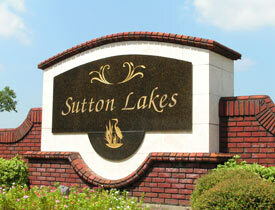 Sutton Lakes residents will find schools, shopping, centers of employment and the beach are all conveniently nearby. Quiet curving streets, conservation home sites and a community pool are just a few of the many reasons to want to call Sutton Lakes home. Sutton Lakes is a residential community with 496 homes. Builders are D.R. Horton, Mattamy Homes (formerly Atlantic Builder), and Maronda Homes. Homesites ranging in size from 1,400 square feet to 2,000 square feet with pricing from the mid $200's.